Gary Foster on his way to a superb personal best time in the Brighton 10K. A Hastings Athletic Club distance running talent produced a superb performance in the Brighton 10K on Sunday. Gary Foster had a blinding run to finish eighth in a field of nearly 1,950 with a time of 32 minutes and eight seconds, smashing his personal best by 52 seconds. Foster finished three places above Jamie Knapp, the Southampton AC runner who won the Sussex Cross-Country League match at Bexhill Down the previous weekend. Another Hastings AC competitor, James Mountford, made the top 20 with a time of 33:41. A party of Hastings AC members, meanwhile, took part in the Bedgebury Forest Half Marathon. Lorna Watts was fourth lady - and first in her age group - in one hour, 41 minutes and 50 seconds. Amy Rodway clocked 1:49.34, Rosy Clements 1:53.50 and Scott Parsons also ran. 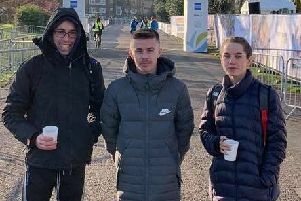 Foster and St Leonards-based Ross Skelton, of the Brighton Phoenix club, are due to line up in the European Cross-Country Trials in Liverpool this coming Saturday.